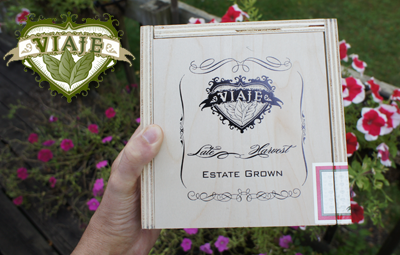 The Viaje Late Harvest is the final, new limited release coming out of IPCPR show. 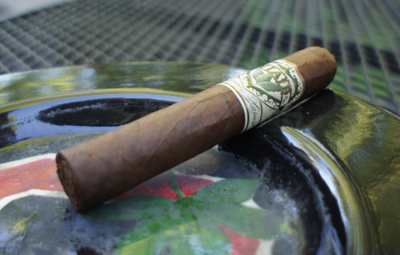 These cigars come in two sizes and, again, are a very limited quantity release. Andre explains the Late Harvest as a "passion project" for him that took about a year and a half to come to fruition. Quote from Andre Farkas: What we did was take the last two primings of the plant and put them into the filler. Added a little bit of viso, and it's unlike any cigar I've ever produced. It has a buttery quality to it. If you'd like to see the interview we did with Andre at IPCPR 2011 where he talks about Late Harvest and all of his other new projects, you can find that here http://vimeo.com/27041732. The first thing that jumped out at me when looking over my Viaje Late Harvest was the additional graphics added to the band. I like what Andre went with there. It's a subtle change, but it added some interest while still looking classy. The wrapper on the cigar was a medium brown color with some hues of red thrown in. The texture of the leaf was pretty vein heavy and had a decent amount of tooth. The pre-lit aroma smelled like aged tobacco with some floral notes. The cap was a little difficult to cut with the type of perfect cutter I had been using due to the pigtail cap, but once I had it off, the draw was excellent. The flavor of the cold draw was a nutty tone, with a distinct Brazil nut taste. 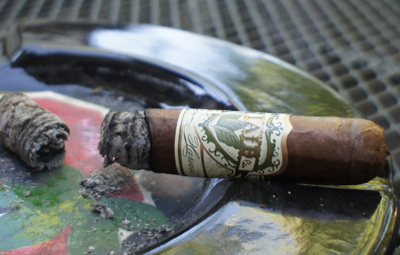 My Viaje Late Harvest lit up easily and started out right away with an interesting mix of flavors. The front of the profile had a mild spice mixing with some clove. I've been a big fan of clove as long as I can remember, so I was happy with this start. The finish on the profile was also very different from what I have smoked recently; tasting like a sweet toffee with some woody notes. It sounds extremely strange, but I think that's the best way to describe what I was getting. It's a very unique flavor mash up, for sure. 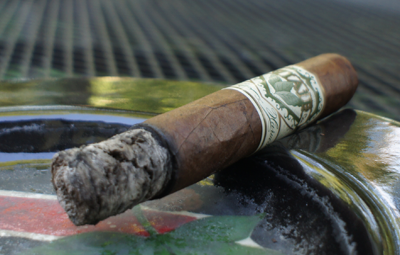 The cigar had perfect construction and was right in the medium strength range. 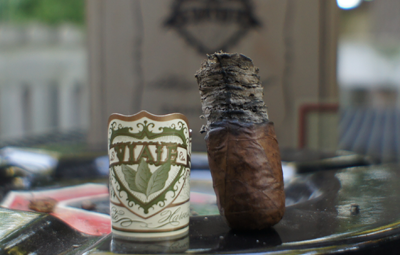 The second third of my Viaje Late Harvest stayed pretty true on the front flavors (spice and clove), but took a different turn on the finish. As different as the finish flavors were in the first third, I'd say the second third was even harder to describe. The best way I can describe it at this point is a "twang" and when blown through your sinuses, it's an even stronger flavor. I was really digging it because it was an enjoyable "twang" and something I'm not sure I have ever tasted before in a cigar. Just like the first third, the construction was great and the burn never died out, even between a few longer resting moments. The strength was still medium. Something I should mention right away is this is a quick-burning cigar. It didn't take me very long to burn to the final third and I was by no means huffing down the stick. Now that I got that out of the way, the final third was completely taken over both on the front and the finish of the flavor profile by the "twang" from the second third. I wracked my brain for a better way to describe it and the best I can come up with is it's a non-specific tart citrus flavor. I've said this before in other reviews, but again, please. If someone else smokes this cigar and has a better explanation for this flavor, please post a comment because I'd love to know what you think. I know everyone will get this taste because it is very strong in the final third. The cigar was easy to nub and the strength never rose above medium. My final thoughts on the Viaje Late Harvest? This cigar tasted extremely different to me and I enjoyed it. The flavor was strong and yet it still took a lot of brain power for me to try to characterize it in words. Aside from the marketing aspect of the "late Harvest", which seems a little too gimmicky for me, this is my favorite of the three new release from Viaje. Would I buy it again? If I can find some more, I will pick some up. Would I buy a box? These come in huge boxes of 35. I'm not sure what the MSRP was for this stick, but I'm going to guess it's way out of my price range in box quantities.